There are some dishes that remind us of our childhood. Foods our mothers made that create a feeling of comfort. For me, one of those dishes is Shepherd Pie. My mother made it often and now I make it for my children and they adore it. It is a great way to use up leftover mashed potatoes and vegetables. I don't know what her secret is, but I have to say now matter how hard I try, mine still does not taste like Mom's. 1/2 cup mixed vegetables or diced carrots, beans and peas. In a large deep frying pan cook the onion and beef until brown. Add the spices, garlic, Worcestershire sauce, vegetables and broth. Bring to a low boil and simmer for 10 minutes. Meanwhile combine four and water in a small jar and shake until smooth. Remove bay leaves and pour in flour mixture. Stir well until thickened. 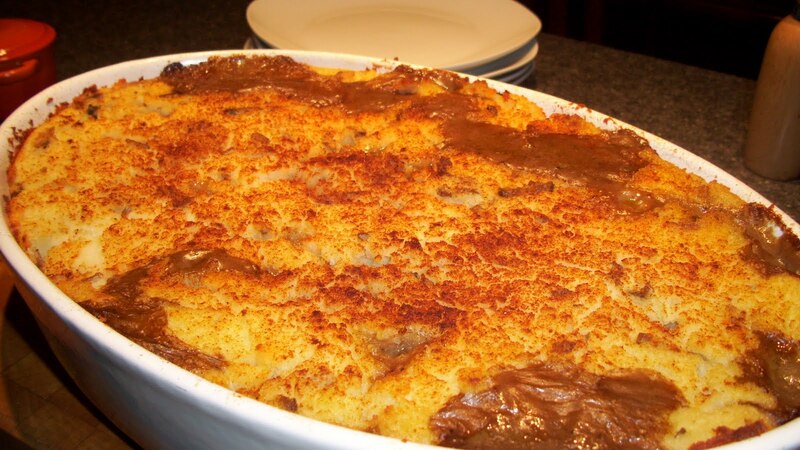 Pour into casserole dish and spread mashed potatoes over top. Sprinkle with paprika and bake in the oven for 20 minutes.